It is not by accident that we have the joy of meeting you. So, above all else we want to express Jesus Christ’s love to you with genuine, heartfelt warmth. We are excited to know that you want to share in the marvelous works God is doing here at Greater New Zion. Whenever we gather here, we learn through the teachings of our pastor; we express our Love for the Lord and each other; and we strive to live according to the Word. The most important part of this ministry is reaching the lost with the Gospel of Our lord Jesus Christ. Those who are taught who they are, how they were saved, need to be trained to go and effectively lead others to Christ. It can be detrimental to send people to win souls that have not been trained, but once trained they need to be sent. Pastor Donald W. Anderson, Sr. was born August 2, 1956 to late J.T. 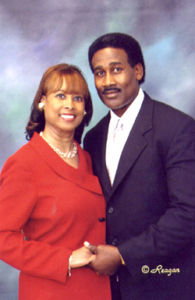 Anderson, Sr. and Naomi Anderson. Shortly after graduating from Benton High School in 1974, Pastor Anderson joined the United States Air Force and served our country for four years until 1978. It was during that time in 1976 that he accepted Jesus as his Lord and Savior. From that time on, he gave himself “continually to prayer, and to the ministry [and study] of the word” (Acts 6:4). Eleven years later, on January 1, 1987, Pastor Anderson publicly acknowledged and accepted the fact that Jesus had called him to preach the gospel. He preached his first sermon on March 15, 1987 and became an ordained minister May 27, 1989. He and his wife, Clodis, reside in Benton, Louisiana.